Central Pennsylvania’s State College is a truly happy place for avid anglers. It’s recognized as one of the Keystone State’s best trout fishing destinations with more than 216 miles of trout fishing waters. But trout is not all you can catch in the areas waterways, perch, catfish, and bass are also abundant. Whether you fly fish or cast a line from the shore, here are the places to drop a line in Centre County. Want to catch a wild brown trout? Break out your waders and fly rod to reel one in at Spring Creek. The catch-and-release creek is one of the most densely populated trout streams in Pennsylvania—and it’s just 15 minutes from State College. Access is easy thanks to a road paralleling the stream, and wading is legal everywhere but a place called Fisherman’s Paradise. 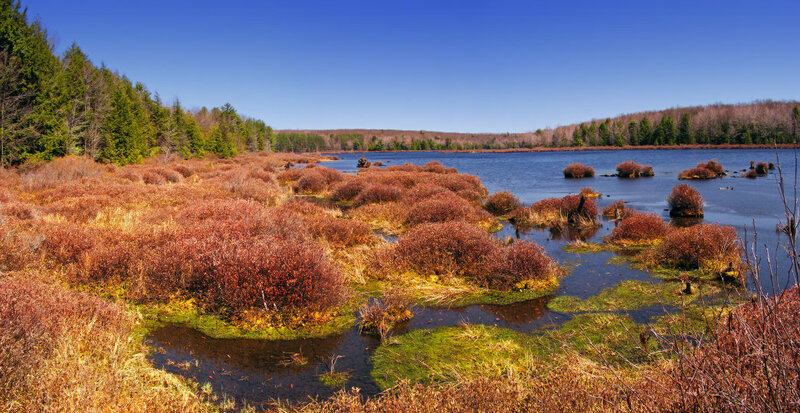 Located atop the Allegheny Plateau, 30 minutes from State College, Black Moshannon Lake is known for its tea-colored waters. Though it’s fed by clear spring water, the water flows through mossy bogs and becomes colored by plant tannins. 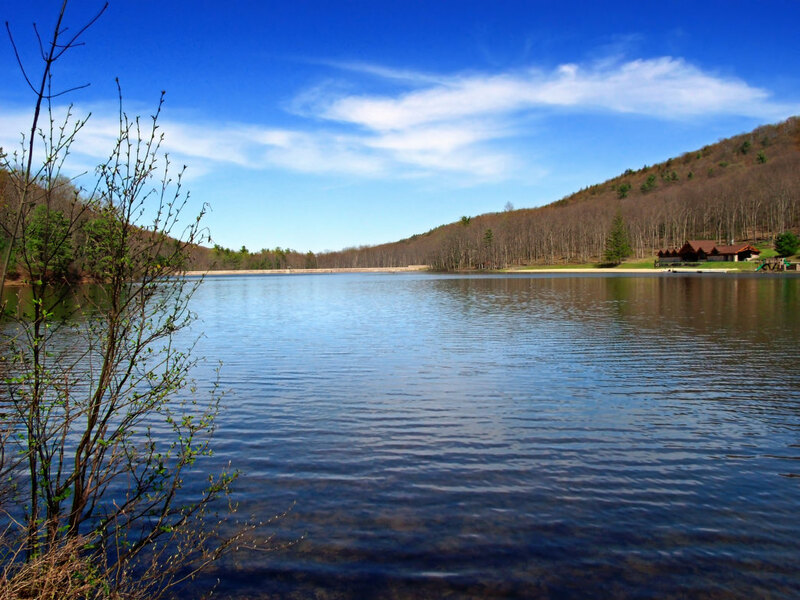 Anglers here can reel in warm water fish like bass, perch, catfish, and pike, or head below the lake to Black Moshannon Creek in search of trout. This accessible creek is stocked with trout and has small numbers of wild brook and brown trout—all available for catching. Home to the Bald Eagle Trout Fishing Tournament, this creek in Bald Eagle State Park is a tributary of the West Branch Susquehanna River and is located a half-hour from State College. It’s a peaceful, but popular, place for fly-fishing with excellent trout, rock bass, and smallmouth bass in the upper section with crappies, perch, and smallmouth bass in the lower section. F.J. Sayers Lake’s 24 miles of shoreline and location along forested Bald Eagle Mountain make it one beautiful place to catch a fish. The 1,730-acre lake draws much of its water from Bald Eagle Creek, and is excellent for fishing warm-water species species like crappie, largemouth and smallmouth bass, and perch. Recognized across the nation for its green drake mayfly hatch in June, fly fishers also come to Poe Paddy State Park for sulphur and caddis fly hatches in May. Wade in and cast a line for wild brook and brown trout in Big Poe Creek, a short distance from the park. Or follow the trout enthusiasts to forest-surrounded Poe Lake, where crowds flock in mid-April for the start of trout season. Fish from the shore or by boat in summer, or wait ‘til the lake ices over for the winter fishing season. In addition to trout, the lake’s home to catfish, pickerel, sunfish, and perch. Pennsylvania’s longest limestone stream, Penn’s Creek bubbles from Penn’s Cave and is an outstanding destination for wild and stocked trout fishing. Experts call it some of the East Coast’s best fly-rod fishing, and anglers can catch brown and rainbow trout weighing more than seven pounds. The creek boasts 35 miles of fishable waters, but most trout anglers focus on the 11-mile stretch from Coburn to Cherry Run. The lower 3.9 miles are all catch and release while trophy trout rules apply to the upper seven miles. Expect fly-fishing crowds in late May and June when Green Drakes, a popular mayfly, hatch in high numbers. 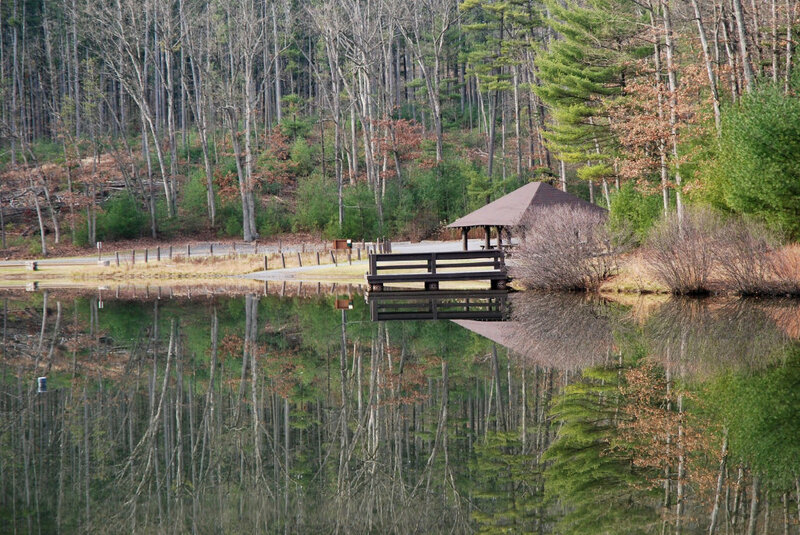 Just 20 minutes from State College near Petersburg, beautiful 22-acre Whipple Lake is surrounded by towering trees and stocked with trout by the Pennsylvania Fish and Boat Commission. The lake is open for shore, boat, and ice fishing, for year-round fishing, but gas-powered boats are prohibited. This big bass lake sits atop the flooded remains of Millford Mills, a farming and milling community evacuated in the 1970s to build a dam designed to provide more drinking water. The steep-sided valley means the waters are deep and ideal for bass fishing, but anglers cannot keep any bass less than 15 inches long due to its big bass designation. No gasoline-powered boats are allowed. Written by Jenny Willden for RootsRated Media in partnership with Visit Penn State.